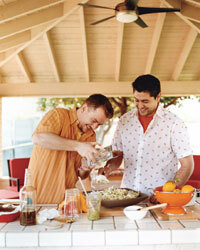 Four of America's best young chefs let loose during a revved-up weekend in Arizona. When three New York City chefsJohnny Iuzzini, Cornelius Gallagher and Shea Gallantedecided to visit their friend Bradford Thompson in Scottsdale, Arizona, the idea was to get as far away from the pressures of their high-profile kitchens as possible. That's how four of the hottest young chefs in the country found themselves sitting astride all-terrain vehicles (ATVs) one morning, impatiently waiting to race over the pitted mountain slopes of the Sonoran Desert at perilous speeds, risking limb if not life. But first their guide from Stellar Adventures has to explain the safety rules and regulations in mind-numbing detail. Finally, he concludes with, "Don't do anything wild and you guys won't get into trouble. And avoid the slippery muddy spots." He clearly doesn't know his audience. With a holler and a roar and much gratuitous revving of engines, the four friends take off, zooming across the sloppy wet earth and out of view. Ever since Thompson, 36, left New York to become chef de cuisine of Mary Elaine's at The Phoenician two-and-a-half years ago, the guys' only chance to spend quality time together is on short trips like this one. They sometimes convene at Iuzzini's cabin in the Catskill Mountains of New York. But this time, they decided to try off-roading, with its daredevil posturing and undercurrent of dangerideal for chefs who wreaked havoc while working together at Daniel in Manhattan seven years ago. That's where Thompson, Iuzzini and Gallagher earned the collective nickname "Pyramid of Darkness"; Gallante became friends with them a couple of years later. Their list of anticsincluding chasing each other with spoiled, week-old saucesis long and worthy of a frat house. "Those were the good old days," says Iuzzini, 30, a former club kid with a penchant for leather pants and a history of blue hair. Even though it was their wild sides that brought them together, the four men also admire each other as chefs. "That's maybe the most important bond we have: mutual respect," says Gallagher, 33. "I've had some of the best meals of my life when one of these guys was cooking." Their mentor, Daniel Boulud, is also impressed: "They sometimes get out of hand, but they are very passionate and very talented. They'll do fine in the end...I hope." So far, they certainly have. After working at Daniel as a sous-chef, Thompson moved to DB Bistro Moderne (another Boulud outpost) then landed at Mary Elaine's, where he was named an F&W Best New Chef 2004. There, he's known for melding contemporary French and American cuisines, as in his seared foie gras with maple syrup aged in bourbon barrels. Before his stint at Daniel, Gallagher worked for a remarkable roster of chefs, including Marc Meneau in France and David Bouley in New York. After leaving Daniel, he went to Oceana, where he was named an F&W Best New Chef 2003 for updating the seafood canon with dishes such as his pastry-wrapped loup de mer with tamarind and wasabi essence. After Gallante, 32, worked as chef de cuisine at Bouley, he became chef at Cru, where he adds postmodern touches to dishes such as live sea scallops with buffalo mozzarella, caviar and roasted peach. And Iuzzini, the executive pastry chef at Jean Georges, is famous for multicourse desserts that include such refined combinations as salted caramel mousse with roasted apple jam. After returning from their ATV adventure exhausted, with Gallante slightly bruised from a wipeout, they head over to the house of one of Thompson's co-workers to rest before dinner. But 10 minutes of lying around is all they need. Iuzzini, the most frenetic of the bunch, jumps on Thompson's back, trying to put him in a choke hold. Gallante starts pitching grapefruits picked from a tree in the yard to a stick-wielding Gallagher. Fruit explodes all over Thompson and Iuzzini. Finally, the four get down to the business of making dinner. Thompson wipes grapefruit pulp from the top of his shaved head as he throws peach halves on the grill for an arugula and frisée salad with Cabrales blue cheese and toasted walnutsa classic combination of fruit, nuts and cheese. Gallagher stands next to him grilling tuna for a bruschetta that he'll top with a chipotle crème fraîche. Afterward, he helps Gallante grate grilled ricotta salata over the warm pasta that's been tossed with fresh salsa verde. Iuzzini is in the kitchen digging through the freezer for coffee ice cream, which he'll use for his banana splitswarm, sugar-glazed, grilled bananas topped with silky mocha sauce. When they cook together, the chefs focus on dishes that are hearty and quick, yet still intelligent enough to impress each other. Which is the point. Two days before the dinner, Thompson called one of his purveyors and ordered five pounds of rarified Wagyu (American Kobe-style) beef to replace the hanger steaks they were originally going to marinate in garlic, rosemary and thyme before grilling. As Gallante flips the meat, the others stand around him, admiring the deep-red meat marbled with thick veins of pure-white fat. "Awesome," is the consensus, uttered between sips of watermelon-and-ginger limeades spiked with rum. "I always get my Wagyu from Snake River Farms in Idahoit's the most consistent," Thompson says. "I use True World Foods. I think their stuff is amazing," Gallante retorts. They eye each other for a minute. Will another wrestling match break out? Instead, the four take their seats around the picnic table to do what they set out to do all along: enjoy the meal they made for each other, in each other's company. Melissa Clark has written 17 cookbooks, including the forthcoming Chef, Interrupted.